The AccuMail Verify API allows you to integrate the power of our point of entry, real-time address verification service into your applications. Available in both REST and SOAP interfaces, this address verification API deploys rapidly and prevents inaccurate or incomplete data from entering your systems. CASS Certified for accuracy by the USPS, the AccuMail Verify API makes sure that each address entered is validated before it enters your database. Addresses are standardized and elements such as the ZIP + 4 and the County Code added. No more incomplete addresses, incorrect ZIP Codes or misspelled street names. Enjoy quicker, more efficient data entry and all the benefits that more accurate data brings to your entire organization. To download an AccuMail Verify API brochure, click here. More Accurate Data – it costs much less to correct addresses at their point of entry than trying to fix issues that arise once bad addresses have entered the system. Seamless User Experience - because AccuMail Verify is fully customizable and integrated into your existing applications and address forms, addresses are validated without users ever leaving the page. Address validation happens in real-time and website visitors will appreciate the efforts you are taking to ensure the accuracy of their information. Lower IT Costs - we host all the postal data on our servers, so there are no monthly updates to install. We take care of all the maintenance and server costs so you don't need to. Lower Mailing and Shipping Costs - cut undeliverable mail and packages and save on postage, printing and other costs, such as expensive Address Correction Penalties charged by some shipping carriers. Plus our built-in RDI feature lets you know whether each location is a business or residential address. Increased Customer Satisfaction – lost or late deliveries due to inaccurate address data can damage your reputation and hurt your business. The AccuMail Verify address verification API ensures you get the right address every time and can even improve your delivery times. Plus, the entire user experience, will leave a positive impression on your customers, who can see that you care about getting things right. Helps To Fight Fraud - verifying addresses prior to accepting orders can help fight against fraudulent purchases. 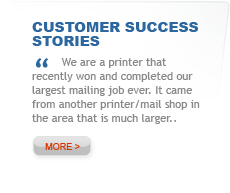 Increased ROI – less returned mail, lower mailing and packaging costs, fewer address correction penalties from carriers, less waste, greater returns on your sales and marketing campaigns, faster customer payments and more. Enjoy the benefits of accurate data across your entire organization with the AccuMail Verify address verification API .